there I was, aboard a Southwest Airlines jet, paging through the March issue of Spirit magazine, when I came upon Brad Meltzer’s article “No One is Born a Hero” in which he shares how he came to write his newest book, Heroes for My Daughter (Harper, April ’12). Faster than a finger snap, today’s assigned blog post celebrating National Women’s History Month took front and center in my TeachingAuthor’s mind! Meltzer chose fifty-five remarkable and diverse individuals – from Eleanor Roosevelt to Amelia Earhart, from Anne Frank to Lucille Ball, from Sally Ride to Randy Pausch, to guide his daughter’s journey to adulthood. Each was a fighter in his or her own way. I couldn’t help think, though: many were the very same “fighters,” female “fighters especially, whose childhoods I had read about in the “orange true books” that marked my childhood’s most special occasions. And I couldn’t help ask: which Heroes would I choose, or rather, which Heroines, to include in my collection had I mothered a daughter? Which then got me thinking: who would I choose were I to write a collection entitled Heroines Who Keep Me Moving on My Writer’s Plotline? Lickety-split, I had my top three Heroines + this Golden Opportunity to introduce them to our readers. please meet Phyllis Harris of Ames, Iowa. When I first met Phyllis, at an SCBWI Woodstock, Illinois Writers Retreat, in the late ’90’s, she’d just begun her graduate studies at Vermont College. She was 71 and 4 years widowed, earning her MFA in Writing for Children! Phyllis’ short stories have been anthologized with those of Margaret Atwood, Carol Farley, Lisa Wheeler and our very own TA JoAnn Early Mackin in Stories Where We Live – The Great Lakes (Milkweed), as well as in other collections. Her publishing credits also include children’s magazines and poetry journals. So many times I've let my increasing chronological age stop me in my writer's tracks...until I think of Phyllis and I'm out the metaphorical door. Say "Hello!" to writer Beth Finke, of Chicago, Illinois. All who know Beth shake their heads in wonder at her spirit, her passion and her ability to connect. 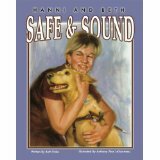 Her beautiful seeing-eye dog Hanni inspired her beautifully-written picture book, Hanni and Beth: Safe and Sound (Blue Marlin Press) which in turn inspired children – and their teachers, librarians, parents and neighbors – around the world. Beth writes with candor, humor and an all-out appreciation of Life, whether she’s writing for Easter Seals, NPR or a Letter to the Editor. Whenever I've allowed Life to somehow overwhelm me, I retrieve my mental image of Beth and Hanni, out-and-about – in downtown Chicago, at Printers Row Lit Fest, on a school visit, at a conference. The two help me see a path I might take. Finally, hug and “Howdy!” (and I mean HUG!) Brenda Yee of Rochester, Michigan. Once again, SCBWI connected me to another Kindred Spirit, at the same Woodstock, IL Retreat Phyllis Harris attended; Brenda later served as the Michigan Chapter’s Assistant Regional Advisor. For years I’ve carried in my trusty Filofax a tiny sticker photo of Brenda and me, taken in a Photo Booth on the Santa Monica Pier. 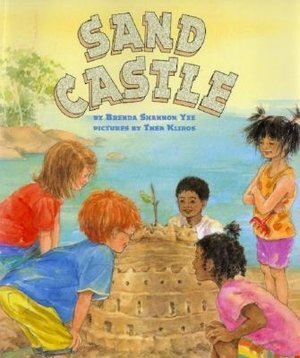 Ten years ago, as children were reading her first published picture books, including Sand Castle (Greenwillow), Brenda suffered a life-altering stroke. But guess who’s back, moving forward on her Writer’s Plotline, having persevered non-stop, 24/7, with the help of family, writing kin and friends, to RE-learn from scratch all she'd forgotten. Brenda re-teaches me every time I forget: none of us are safe from Life’s unexpected turns, but that doesn’t mean we can’t find some way, a way, any way, to pick ourselves up, put one foot in front of the other and keep moving forward. The word story comes from the word history, which means "a narrative of events." And history’s story? It comes from the Greek word “historia” which means "to ask or inquire, to learn and know." Like all Heroines worthy of our celebration, Phyllis, Beth and Brenda overcame odds and a variety of limitations to realize their Dreams and return home triumphant. By doing so, they unknowingly kept me moving forward, so I could learn and know my story so my readers could do the same. It goes without saying, Women's History Month or not, I remain forever grateful. This isn't exactly a Writing Workout, but what Heroines would you choose for your Lifetime collection?
. . . just wanted to let you know how flattering it is to be chosen as one of the three heroines you highlighted in this post, I know you meet TONS of people in your intrepid life and I am so glad to have been one of the lucky women to cross your path - I think you're swell. Esther, I love this post to pieces. xxoo to you, Phyl! Deserved Laurels for Our JoAnn EARLY Macken! What if Laura Ingalls Hung Out at the Mall? Economics, Looking Ahead, & March 4th!